"I have written since I was a child. At six or seven, I did my first little stories. I talked about animals, kid things. At about 15, I started with poetry. I always write. In airplanes, in bed, in the bathtub." "Writing and acting are like being a kid again"
"I've always liked to write stories and poems," says Mortensen. "I learned watching other people do it and by trial and error, just like acting." "Poetry," he says," is a way to look at life from multiple points of view, a feeling of duplication which even gets more intense if you do it in two languages, like I do." 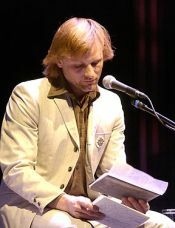 To Viggo, poetry is a way to leave reality behind in order to reach another, purer reality, away from those commonplace moments and the difficult situations for which there's no apparent relief. Poetry, to him, is a way to put the world into perspective. About Them... "I like a brave woman"
"For me, it's like taking apart an engine. You take all the pieces, you put them on a table and when you finish putting it together, you leave some of them aside." How much of your life is in your stories and poems? Like all writers, I write many different things, but you always create using your own life, even if everything is imaginary on the page. As much as you invent a totally distinct world, there's always something of yourself, even if you don't realize it. I contribute my experiences as a person who's travelled all over and has had a somewhat unusual bond with language. Canciones de invierno [Winter Songs], for example, has things that seem to be very true and very much mine, and they aren't. Maybe the writings where I hide or invent myself are more my own than those that are directly autobiographical. "I always kept writing in Spanish. But I realized that my language was out of date. It was my parent's language. Then, with the long trips to Argentina and Spain, close contact with the language allowed me to enter a new stage, more up to date and rich." ....if you´ve written a poem and you read it, you don´t know what will happen. Something changes between my mouth and the eyes and ears of those who are there reading or listening to my words, my little story. Something changes between writing it and pronouncing the words. I don´t know what the reader receives. There´s no net. For that reason, I'm responsible for what I´ve written and for how I read it. Mr. Mortensen's poetry is not your typical verse and rhyming couplet-type thing, or even the more acceptable modern version of free verse. He creates something more along the lines of prose pictures, imagery forged in words that seek to define, in the words of Joyce that he quotes so appropriately in one of his books, the conciseness of his race. His search for artistic expression or credibility is organic and promiscuous. When it's pointed out that people might come to his poetry readings or buy his books because he's a movie star, he nods, accepting this. "Sure, sure - I'm not unaware of that. I know if I announced that I'm going to do a book signing tonight with no advance warning, there will probably be a bunch of people there because of the movie. But some people will come to hear the reading and some people will come because of The Lord of the Rings. I don't care. If they come and hear the poems and they have a reaction pro or con, and there's a connection made between me and them - then who cares?" The author of two published books of poetry, Mortensen crafts spare, fine-tuned verses that end with the sharp report of a metaphor hitting its target. Most paint a languid picture of West Coast suburban life a milieu of cars, swimming pools and lovers' conversations; some ruminate on the life of the movie actor with surprising acuity. These [Mortensen's] poems seem close to the way his mind works: things tend to be collaged in where they almost fit, or, more precisely, they fit in the only way they can: almost. The poetry works because Mortensen is Scandinavian (Danish father, American mother), says Manhire, "and there is this Scandinavian myth about how poetry is a mixture of blood and honey - his poetry has that mixture." Are your poems born from happiness or from pain? I've probably written more poems about moments that have some kind of complication. But I think there are elements of both. "I sometimes gravitate toward one language or another or a certain structure for a poem or short story. In the past year or so, I've been writing mostly in Spanish for some reason. Whatever I was feeling, I felt like I've got to express it in Spanish. I'm not sure why that is. Maybe it's because I've been hanging around Spanish-speaking people or Spanish-speaking countries a lot recently." 'It is important to protect living poetry, which is also why I participate as often as I can in public readings." "The success of the Lord of the Rings trilogy changed the deal a little. Before then, when I put on a poetry reading, there would just be a circle of my friends around me. Now there are hundreds of inquisitive strangers. If fame can make an under-appreciated art better known, it's perfect! "I wrote that one while thinking about my childhood, the mental and physical strength children have: the daring, the innocent courage, the absence of prejudice, the visceral connection with nature, with the environment that surrounded me, which seemed to threaten me and embrace me..."
Diario Crítica de la Argentina. "Patches of recorded feeling vanished, irretrievable. There is no point in trying to remember and rebuild the word houses, word hills, word dams, or word skeletons like some sort of archeology project. There may be pieces I recall or inadvertently retell, but every word will be new, will go somewhere, will die no matter what I might do to tame or hold it."